Word lets you easily transform your document into an interactive and easy-to-share Sway web page that looks great on any device. So instead of my regular post about a generic new feature of Office 365/2019, let me show you how this new feature solved a problem for me. Yesterday my semester started at my college in Virginia. Last week I wanted to send out a Word document to all of my students about how they can connect with Cengage Unlimited with their Shelly Cashman Office textbook and SAM integration. The Word document that I had created had an embedded video about Cengage Unlimited right in the document instead of a link, because I felt it was key to understand. I was honestly worried that they would not click the link without the video actually being in the document--see below. With the video in this file, the Word document size is almost 20MB, which is a problem. My LMS will not upload or email a file that large. So onward to my solution using the new feature "Transform"! 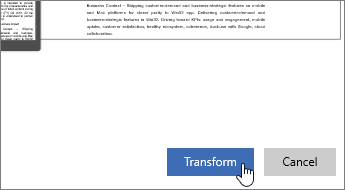 On the File tab in Word, go to Transform > Transform to Web Page. Scroll the Style thumbnails and pick one you like. The Preview updates to show you how your document will look as a Sway web page, on a full size monitor and on a phone (Sway web pages are designed to look great on any device including student's phone. We know that our students see most email on their phones). When you've selected a style you like, click Transform. After your Sway web page is created, use the Share button near the top of the screen to get a link you can send out, or simply copy and paste the URL from the address bar. First select the radio button for Share with anyone with link. 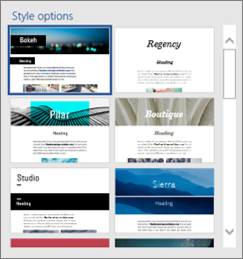 This is really a useful tool - I'd never heard of it before - and your Sway looks terrific. I can envision many uses for this! Thanks for sharing it.